Most people are familiar with the popular image of elves as Santa’s helpers and dwarfs as little bearded men wearing red caps, who are mischievous and playful, helpful and sly, industrious and dexterous. But their roots go far deeper than their appearance in fairy tales and popular stories. Elves and dwarfs are survivors of a much older belief system that predates Christianity and was widespread throughout Western Europe. Sharing his extensive analysis of Germanic and Norse legends, as well as Roman, Celtic, and medieval literature, Claude Lecouteux explores the ancient, intertwined history of dwarfs and elves. He reveals how both were once peoples who lived in wild regions as keepers of the secrets of nature. They were able to change their size at will and had superhuman strength and healing powers. They were excellent smiths, crafting swords that nothing could dull as well as magical jewelry, and often entered into the service of lords or heroes. They were a part of the everyday life of our ancestors before they were transformed by fairy tales and church texts into the mythical creatures we know today. Lecouteux shows how, in earlier folklore, elves and dwarfs were interchangeable, gradually evolving over time to express very different kinds of beings. “Dwarf,” “giant,” and even “elf” did not necessarily connote size but referred to races with different skills. Elves were more ethereal, offering protection and kindness, while dwarfs reflected a more corporeal form of spirit, often appearing as messengers from the underworld. Yet dwarfs and elves could be bargained with, and our ancestors would leave a broken object outside the door at night with the hope that a dwarf or elf (or other local spirit) would repair it. 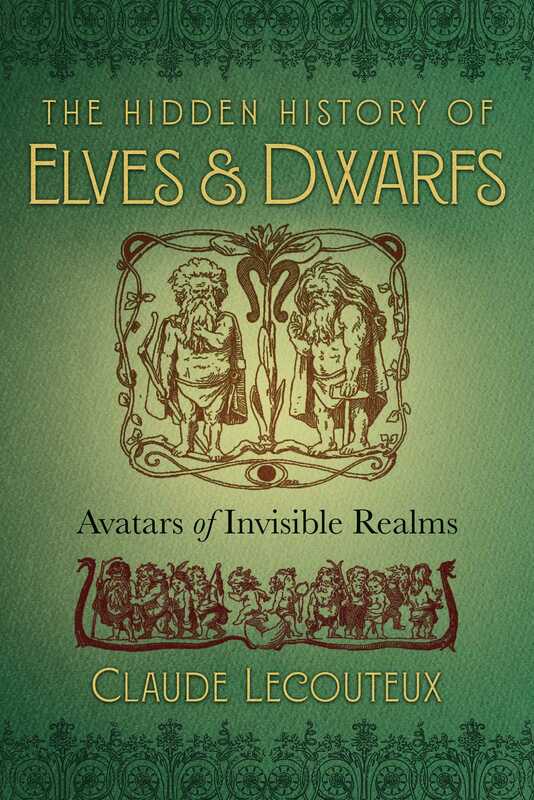 Revealing the true roots of these helpful and powerful beings, including an in-depth exploration of one of the most famous dwarf/elf/fairy beings of the Middle Ages, Auberon or Oberon, also known as Alberich, Lecouteux shows how the magic of dwarfs and elves can be rekindled if we recognize their signs and invite them back into our world. It was around the years 1023-1050 that a dwarf was mentioned for the first time in the literature of the German-speaking regions, but non-literary texts show that this figure was known long before this date. The Ruodlieb, which is considered to be the first romance of the Middle Ages, was written in Latin, based on legends whose traces we can find in later works. It tells of the encounter between a knight and a dwarf, and this encounter deserves a momentary stop as it includes all the principle characteristics of the German dwarf found in subsequent tales. Unfortunately, the eighteenth fragment of the Ruodlieb stops here. We should keep in mind the essential information gleaned from this story: dwarfs live in caves, they know hidden secrets, and they have the gift to foretell the future. Furthermore, they inspire distrust in those they meet, which implies not all of them mean well. All the later texts confirm what the Ruodlieb says and add some finishing touches. (29) The dwarfs dwell inside hollow mountains that are veritable underground palaces sparkling with gems. They have wives and children, suzerains, and vassals and live in a hierarchical society that is a perfect reflection of medieval society. There is a nobility with a king at its head. Only peasants are not mentioned, but they rarely appear in courtly literature. Dwarfs experience the same passions as men, especially the torments of love and the goad of ambition. They wage war among themselves to expand their domains, in other words to conquer other hollow mountains. They have hereditary enemies: giants and dragons. Their amusements agree on all points with those of the human world: they love music, singing, dancing, good meals washed down with wine or mead; they organize jousts and tourneys on the green meadows that extend before their underground palaces; and finally, they know how to speak courteously. The great majority of them are well-meaning and helpful; only the Arthurian romances, in agreement with romance literature in general on this point, portray perfidious or thieving dwarfs. Dwarfs can appear in one of three ways in the Germanic regions. They can take the appearance of bald, bearded old men, or resemble extremely beautiful children, or else look like knights. The first type is quite rare in the Middle Ages, although it is the predominant type in later folk tales. It is vouched for by only three texts. (30) The child dwarf is equally rare and only appears in the Gest of King Ortn. (31) These first two types are incontestably the oldest and the least contaminated, but they were supplanted by that of the dwarf knight, a reflection of the era in which the poets lived whose work I am using--and they almost vanished completely from the writings. Their resurgence several centuries later indicates nevertheless that they continued to live in oral folk traditions. Dwelling inside mountains or even underground, and sometimes even behind a waterfall, the dwarf knew all the secrets of nature: the virtues of the waters, stones, metals, and herbs. Of all the monstrous humans of Medieval German literature, the dwarf is the only one to wield magical powers. He knows how to turn invisible, thanks to a magic cape (Tarnkappe) or headgear (Tarnhelm), an object that plays an important role in the legend of Siegfried. The dwarf can also travel in an instant to wherever he wishes to go, like the fairies in the romances. He owns rings in which marvelous stones are set, and belts that multiply the strength of the wearer, or provide protection from poverty, hunger, and so forth. He owns certain gems that would be quite useful for students of living languages because when placed beneath the tongue, they make it possible to understand and speak foreign languages. They also prevent thirst and prevent dragons from attacking; in short, nothing is a priori impossible for them. The dwarf knows the future, which implies a connection to the other world, but a later, rational explanation redefines this knowledge as the fruit of the study of necromancy, which, during the Middle Ages, was synonymous with sorcery. “In The Hidden History of Elves and Dwarfs Claude Lecouteux’s wide-ranging knowledge and insights are focused upon a significant part of European magical tradition and mythology, the realm of what he calls ‘lower mythology,’ of which the dwarfs are the best-known and most persistent characters. In Northern Tradition mythology, dwarfs are best known for making precious and magical artifacts such as Odin’s spear, Thor’s hammer, Freya’s necklace, and the golden-bristled boar of the gods. Apart from making jewelry, weapons, and armor for the gods, the dwarfs have their own magical attributes. Aubéron has a bow whose arrows always hit the target, an impenetrable chain-mail coat, a horn, and magic cup. Dwarfs are remembered in ancient Scandinavian place-names, and folktales from all over Europe embed the memory of dwarfs in the fabric of storytelling. Emerging from dense forests, mysterious lakes, burial mounds, and hollow mountains, sometimes they aid humans, but often they are unreliable assistants, for they have their own agendas. They exist within a world of fluid boundaries where transformation plays a major role.